Dedicated to limit the environmental impact and carbon emissions, Lebanon is one of the 195 countries who made history by taking a part in the Agreement at the Conference of the Parties (COP21) in Paris in 2015. In the same year, the government published the Intended Nationally Determined Contribution (INDC) with the purpose of reduction of the possible risks and irreversible consequences of climate change on its already-stretched economy and natural resources. Although Lebanon’s share in global greenhouse gas emissions is just 0.07%, the governmental intention is to establish healthy legal, infrastructural and financial working environment for local private entities and align their goals with its emission reduction target of 15% by 2030 called upon by the Paris Agreement, in order to rise the market competitiveness, maximize economic profit, create job opportunities and secure greener future. In 2017, Green Mind, the United Nations Development Program in Lebanon and the Banque Du Liban formed the Lebanon Climate Act, which is supported by Ministry of Environment, The Federation of Chambers of Commerce, Industry and Agriculture in Lebanon, European Union ClimaSouth team and the Federation of Chambers of Commerce, Industry and Agriculture. The Lebanon Climate Act aims at creating economic growth in a way that creates value for the society by addressing Climate Change challenges. It is oriented toward the private and public sector and civil organizations, to support them in understanding the climate challenges, undertake suitable actions and jointly establish a climate-resilient economy. 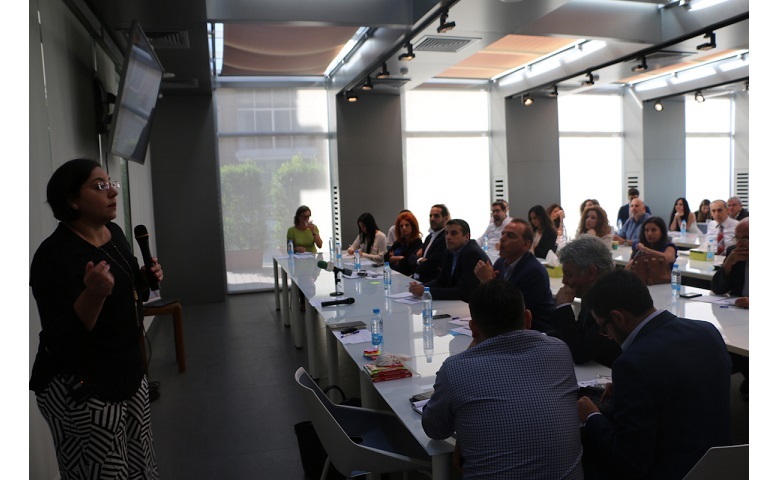 Business Knowledge Platform, under the Lebanon Climate Act Program, is launched with the aim to introduce the climate change fundamentals to Lebanese companies, and assist them to assess and manage their carbon footprint, identify and engage with stakeholders, create customized climate action plans and share experiences and achievements. With the support of Sustainability Knowledge Group, through a series of training workshops, webinars and a detailed informative guidebook, the Business Knowledge Platform was successfully implemented. The aim of the guidebook developed, is to offer best practices and steps for companies and organizations to develop their bespoke strategy roadmap. With exercises and relevant advice, companies can develop and implement a corporate climate change strategy and battle climate change challenges in a value adding business.